BARCELONA -- Homeowners worried about cybersecurity attacks on IP-connected devices like lights, baby monitors, home security systems and cameras, will soon be able to take advantage of a $200 network monitoring device called Dojo. The device, called a pebble, was shown at Mobile World Congress here this week and will go on sale online in April. While the Dojo device isn’t intended to provide enterprise-level security, it could be used to help, in a small way, in warding off massive attacks like the one that used the Mirai botnet which took advantage of unsecure, consumer-grade cameras and other devices last October. The Dojo by Bullguard is a home security device that analyzes IP packets as they arrive through a Wi-Fi router. Yossi Atias, co-founder and CEO of Dojo-Labs, now a part of U.K.-based security provider BullGuard, said it will be the first product of its kind to hit the market, although security software companies Norton and McAfee are expected to offer competitive consumer products later this year. 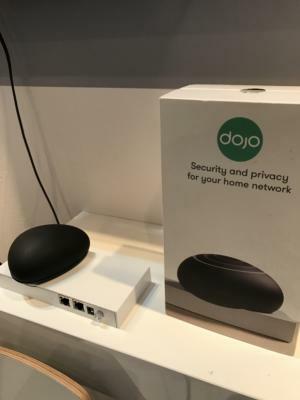 The Dojo hardware connects with a cable to a home’s Wi-Fi router to intercept IP packets and block real-time cyberattacks. It uses artificial intelligence and machine learning to customize a security policy for each device on the network, the company said. Atias demonstrated how the device connects to a smartphone app and alerts a homeowner when an attack on a device occurs. Settings allow a user to block the online attack remotely. The device can also prevent privacy issues by alerting a homeowner if a television or a child’s toy or other object could be monitoring conversations that companies want to use for marketing purposes, Atios said. Nearly two years ago, it was discovered that Samsung TVs could be used to listen to homeowners with a voice command feature. The device runs on a Linux OS. The $199 price includes one year of service. After that, the service costs $10 a month.